Apologies for the long absence but things have been hectic... Work is about to begin on the first Granite Shore album which should be out a little later this year. More on this and other things will be posted soon. Many thanks to Phil Wilson for producing this video for Flood of fortune. 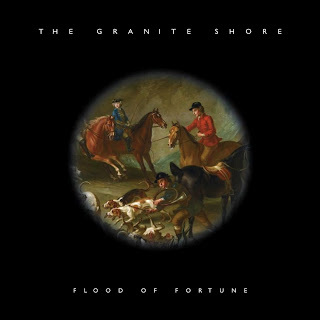 The new Granite Shore single, Flood of fortune b/w Highway code is now available to pre-order from the Occultation website. The single features Nick Halliwell, Phil Wilson (June Brides), Arash Torabi (The Painted Word), Andy Fonda (Some Beans), with full string and brass arrangements by Vaughan Jones and Probyn Gregory (Brian Wilson, Wondermints, etc.) respectively and additional vocals by Bella Quinn. The single was recorded in Devon, London and Los Angeles earlier this year. There is also a digital single, although links to high-quality (320kbps) MP3s are sent out free to everyone who orders the physical single from Occultation. Please note that the promo CDs are strictly limited, so it's first-come, first-served. The second single by The Granite Shore is scheduled for release on Occultation in June. The original sessions for the single, featuring Nick Halliwell, former June Brides frontman Phil Wilson, Arash Torabi and Andy Fonda, took place in Devon in February and were followed by a session in London at which a 56-part string section was added before a brass arrangement by Probyn Gregory (Wondermints, Brian Wilson, etc.) was recorded in Los Angeles. This is a huge record and one we're enormously proud of. Artwork and previews of the two tracks will be posted over the next few weeks and Occultation hope to have copies of the 7" single by early June. More news on this and a number of other recent developments will be posted over the coming weeks. First of all, once again I do apologise for the long silence, but we're currently working hard on the second Granite Shore single and then more records after that. More news about this in the coming weeks. The new single will be Flood of fortune to be released on 7" vinyl on Occultation early in the New Year. Now, to the matter in hand: last year I wrote a piece on The Distractions. One or two people got in touch to say how much they'd also loved the band and... well, that was that for the time being. Then a couple of months ago a comment was left on that particular page from Mike Finney, the band's lead singer, intriguingly mentioning some demos he and chief songwriter Steve Perrin had recorded in 1995 and that he'd be happy to send them to me. Only he said he wasn't sure how to do so and would check the blog again for a message. I immediately posted one asking him to e-mail me and then... Nothing. I thought he must've forgotten all about this and resigned myself to missing out on the chance to hear these demos. Then finally, a few weeks later, out of the blue I got an e-mail from Mike to which he'd attached five songs. Now we all know that generally speaking bands shouldn't reform. 10 years ago I'd've said this was pretty much a rule with hardly any exceptions. However now we know better, don't we? Look at third incarnation of The Wild Swans (who, incidentally, will be releasing a new single on Occultation over the next couple of months, I've heard it and it's another absolute corker, but more of that another time...) if proof be needed. Apparently Mike, Steve and some chums got together and played a few gigs in the North-West and then went into the studio. Some of the songs here were originally written for the Distractions first time around and performed by later incarnations live. What you really want to know, though, is this: are they any good? Well, as Mike has given me permission to upload the tracks here, you can judge for yourselves. For my money the first of them, Black Velvet is among the very finest things in the Distractions canon. It's unusual in that it's roughly twice the length of anything else they ever did but it is absolutely stunning. It has that apparent simplicity which is the hallmark of all the band's work, even though it actually takes a great deal of subtlety to get anything sounding that simple. Mike remains one of the all-time great pop voices, there's something about his singing that sends shivers up and down my spine. The lyric is very much in the classic Distractions tradition too. As Mike says, this is perhaps the logical extension of a track like Looking For A Ghost; and it reminds you just how special this band were, how different from their contemporaries. As a result their records have barely dated at all, and even though these demos were recorded 15 years later they fit seamlessly into the canon. Although Black Velvet is the clear standout, the other four are also pretty terrific; they're much more similar to earlier Distractions in that they're short and oh so sweet. None of these would've sounded at all out of place on Nobody's Perfect. I'm also extremely fond of Good Girls Don't Get To Paris, but all five songs here are terrific. Anyway, here are the five tracks which I've converted to MP3 for maximum compatibility. I'll try and write more pieces on this blog over the next few weeks and months. Thanks to Mike Finney and Steve Perrin for letting us hear these. then I’m sure we can sort something out. I really would be thrilled to hear from you. I was listening to Nobody’s Perfect only the other afternoon. Next, apologies for the long silence. Things have actually been very busy here on The Granite Shore with the release of the first single, which reached shops in the UK (and a few other places on import) at the beginning of June, although it’d been available from Occultation and also digitally (via Believe) for some time by then. We’ve even had a little bit of radio play, especially in Spain. At some point I’ll try and resume some of the musings on other people’s records, books etc. that have caught my ear, eye and other sundry anatomical components but for now let’s just have a quick catch-up. We’re currently working on the follow-up to Tomorrow morning, 3 a.m. and it’ll be a very different kettle drum of fish. First of all, whereas TM3AM was always intended to be an epic, multi-layered piece, tailored to the 10” format, the next single will be... very much a 7” single. So it’ll be under 4 minutes, have a great big chorus within the first minute and, generally... well, the aim is for this to be The Granite Shore’s Big Pop Moment. How it actually turns out is another matter, of course, but early signs are good. The two songs are currently being roughed out and arranged and the plan is to go into the studio sometime this summer, the sooner the better. Then we’d hope to have the single out on Occultation by early autumn. After that we’ll obviously be working on an album for release in 2010. Anyway, as I say, I’ll try and resume more regular posts to this site over the coming weeks. It might be interesting to document the process of making the next single in some way too... But we’ll have to see about that. Loose collectives don’t just maintain themselves, you know. OK, how many great albums can we think of made by people known primarily as actors? Go on, have a go... No? 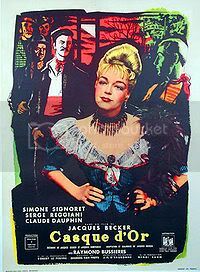 Well, if we expand our horizons to cover France then I've got one: those of you who know your French films will be familiar with Casque D'Or (1952) starring Simone Signoret. 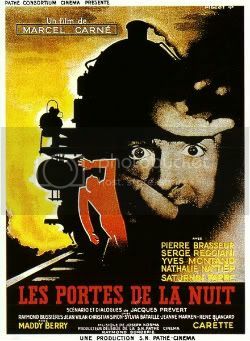 The male lead is Serge Reggiani who'd also appeared in Les Portes De La Nuit (1946), one of the films made by Marcel Carné scripted by the great poet Jacques Prévert (who we'll be talking about in a future Written In Granite). 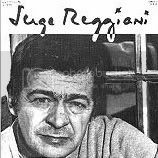 Reggiani was born in Italy although his family - who were held anti-fascist political views - moved to France when Serge was just eight years old. However this piece isn't about his films, fine as many of them are. 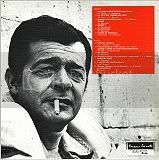 In the mid-sixties, when Reggiani was in his mid-forties, he embarked upon a second (but not last) artistic career as a singer. I'd've loved to have been at the A&R meeting that decided on that particular stroke of genius, I must say. "OK, we've got the perfect new recording artiste... He's 43 years old and he's got a face like a pug..." It worked though. 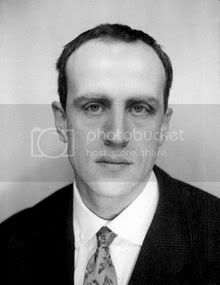 Vian was 39 years old and had packed more artistic activity into his short life than most people would manage if they lived to be 150. Oh, hang on, I've just remembered another of Vian's jobs: talent scout. He it was who first discovered an acolyte of his by the name of Lucien Ginzburg, whose own pseudonym was Serge Gainsbourg. Reggiani himself only really ever managed three or four artistic careers (depending on whether you count the theatre and the cinema as one... Then singing and later on painting) but he was pretty successful in all of them. It's his second album that we're looking at today. It's the one known either as "Jacques Cannetti présente Serge Reggiani" or, sometimes, "No. 2". It opens with Les loups sont entrés dans Paris (The Wolves Entered Paris), a song about the German occupation of Paris which was still very much in the French popular consciousness in the late 1960s. It sets about the task with real class and relish for its thinly-disguised metaphor of wolves. The second track is another of Vian's, La vie c'est comme une dent (Life Is Like A Tooth), a playful piece about how life is like toothache. After this we get our first taste of the thing that makes this into a truly great album, as opposed to just a collection of fine songs from some of France's finest writers: many of the songs are prefaced with apposite lines from classic French poems. So, the third song is a version of Georges Moustaki's Sarah. The title is clearly a Biblical reference, you might remember that Abraham's wife of that name conceived the future patriarch's son Isaac when she was considered past child-bearing age. The opening line to the song is very famous in France: La femme qui est dans mon lit n'a plus vingt ans depuis longtemps (It's a long time since the woman in my bed was twenty). It's beautifully prefaced with Baudelaire's lines about a prostitute. Then comes a Gainsbourg song, Maxim's and then another Moustaki number Ma Solitude followed by Fleurs de Meninges. Side two of the original album opens with Le Petit Garçon, a real favourite of mine, it's got a wonderful feel and atmosphere to its tale of a father and his son abandoned by the mother. More Vian then follows with Quand j'aurais du vent dans mon crâne – prefaced by the opening few lines of Prévert's Pater Noster – "Notre père, qui êtes aux cieux, restez-y..." (Our Father, who art in heaven, stay there), then Moustaki's Ma liberté (My Freedom – not entirely dissimilar from Ma solitude on side one, it has to be said). Paris ma rose is introduced by the wonderful closing lines from Apollinaire's Le Pont Mirabeau and then L'hôtel Des Rendez-Moi Ça, before the truly astonishing finale to the album. Rimbaud's Le dormeur dans le val, describing a young soldier's body lying in a peaceful valley, leading into one of Vian's most controversial songs, Le déserteur which, as the linguists among you will have discerned, translates as "The Deserter". It takes the form of a letter to the President of the French Republic from someone who's just been called up and suggests that the writer would rather run away and be pursued by the police and then shot than go off to war to kill his fellow man. So the list of Vian's accomplishments also includes having a song banned. Was there nothing this man couldn't do?